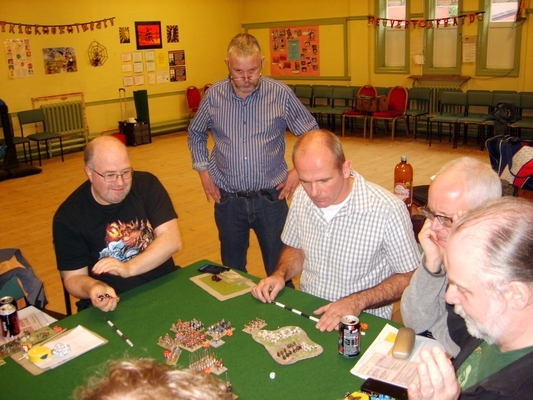 On Sunday Robert Taylor organised a demonstration game of Mark Lewis's new Sword & Spear rules at MAWS. All credit must go to Mark for running the demonstration himself. 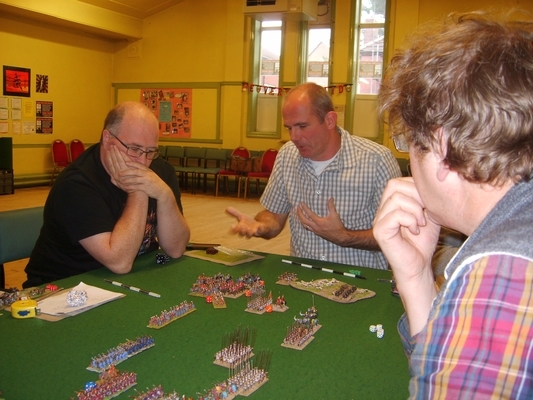 Sadly, I couldn't attend because I had already arranged a 650 point game of Field of Glory (FOG) Renaissance. However, I was able to sit in for while after my game had finished and take a few photos. Graham (standing) watching over Mark's shoulder (right). 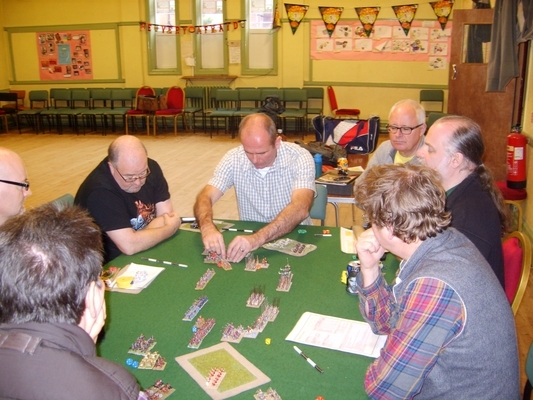 The demonstration was well attended and the novel command and control mechanisms seemed to be keeping everyone engaged in the four player game. Sword & Spear requires a lot of record keeping. It's not paper record keeping but you do need a means of keeping track of which units have been activated each turn, or have had action deferred, or have taken hits. As the game developed there seemed to be dice everywhere. I did get chance to flick through a printed version of the rules and they are very well presented and a snip at £6.00 for the pdf version. Here's hoping Sword & Spear continues to attract new players. There's also a Fantasy version in development. More details at Mark's website.